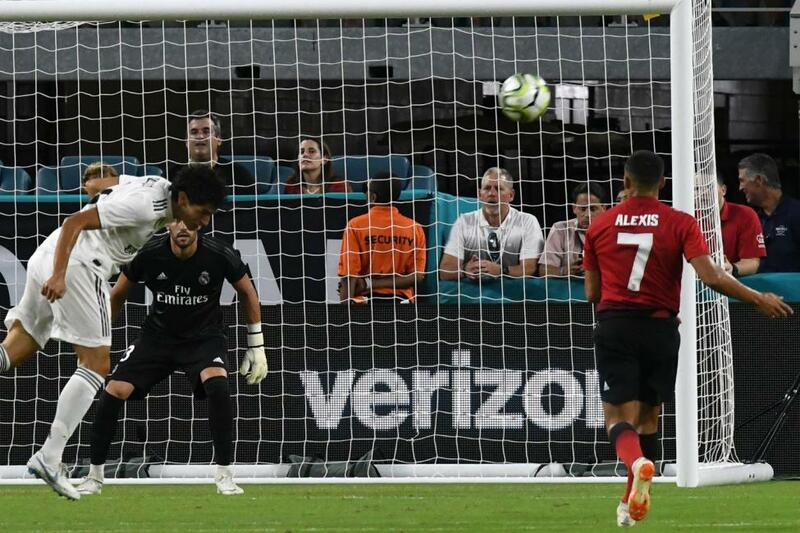 Manchester United's Alexis Sanchez dominated Real Madrid's defense in a 2-1 win in the International Champions Cup Tuesday at Hard Rock Stadium in Miami Gardens. Sanchez woke up the crowd of 64,000 with a score in the 18th minute. The Chilean striker was running down the middle of the pitch before he found his way inside the box. Red Devils right back Matteo Darmian ran onto the ball down the right flank before splitting several defenders with a pass for Sanchez. He hammered home the strike with his right boot, beating Madrid's Francisco Casilla. Both squads used a cast of young players in the preseason matchup, as many of the stars were still on break from playing in the 2018 World Cup. [post_ads]"The match doesn't change anything," United coach Jose Mourinho said. "My professional players were amazing all preseason because they know we play against good teams. We have just a few players here, lots of kids. Our kids are really, really young." "The game today, win 2-1, lose 2-1, draw 2-2 ... it doesn't change anything. But of course I know the players I can count on them. I know that these guys are amazing professional. I know they gave everything for the precision of the club." "The result of the game today is not important. If we play Real Madrid in the Champions League, that result is important, not today." The Red Devils added a second score in the 27th minute. Juan Mata took off behind the Madrid defense on that play. He reached the box and lofted a cross toward the back post, finding Sanchez. The Chilean headed the ball back to Ander Herrera, who booted a left footed shot past Casilla to double the Red Devils' lead. Karim Benzema cut the Real Madrid deficit in half in the 48th minute. The striker hovered into the box on the play before being spotted by Theo Hernandez. The left back took a touch before bending a cross toward the near post. Benzema ran onto the feed, punching it past United keeper David De Gea with his right foot. The La Liga power trailed 2-1 at the halftime whistle, but neither team could find the net in the second half. "They are a very good team," Herrera said. "If you want to make a great season, you can't think to far about the objective. You have to go step-by-step." Madrid battles Juventus in another International Champions Cup matchup at 6:05 p.m. Saturday at FedExField in Landover, Md. The Red Devils battle Leicester City at 3 p.m. on Aug. 10 at Old Trafford. "First of all, we want to win, we always want to win," Madrid manager Julen Lopetegui said. "But right now the most important thing is working together as a team and consolidating the team that we have and to grow as equal as a team. This was their fifth game as a team, where it was our first." "I think overall, physically, tactically, we dominated the match. We created a number of chances. The team showed perseonality and showed a lot of positive things."